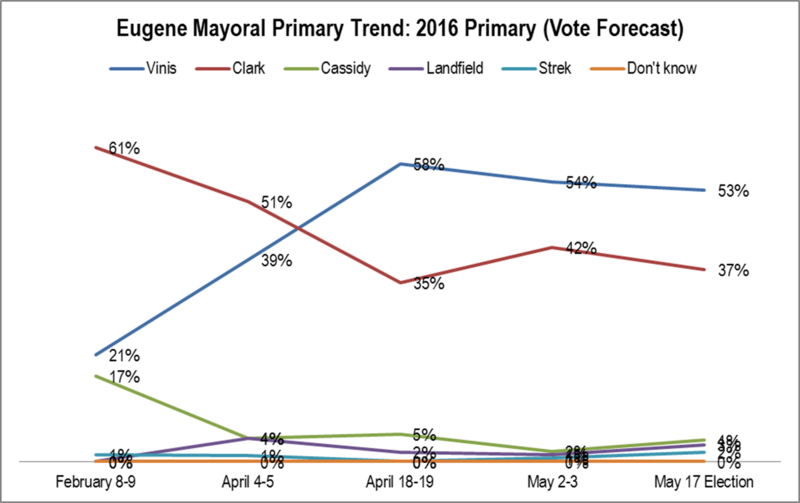 The primary determinants of support in the Eugene Mayoral election polling were first party and second the date of the poll. Clark did better among Republicans and Others and Vinis did best among Democrats. Clark steadily consolidated the Republicans as Vinis did the Democrats. 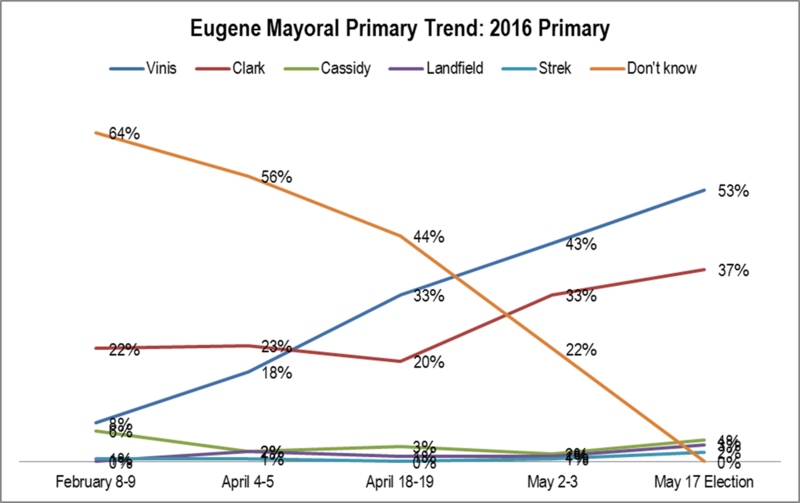 QUESTION: If the Eugene mayoral election were held today, would you vote for: Mike Clark, Bob Cassidy, Stefan Strek, Lucy Vinis, or Scott Landfield [ROTATE NAMES]? IF DON’T KNOW: Which way would you lean? NOTE: Landfield not included on Feb. 8-9 survey because he had not yet announced his candidacy. This graphic takes the polling data and models the likely vote percentage for the two candidates. It’s typical in local races for voters to be unfamiliar with the candidates until late in the process. 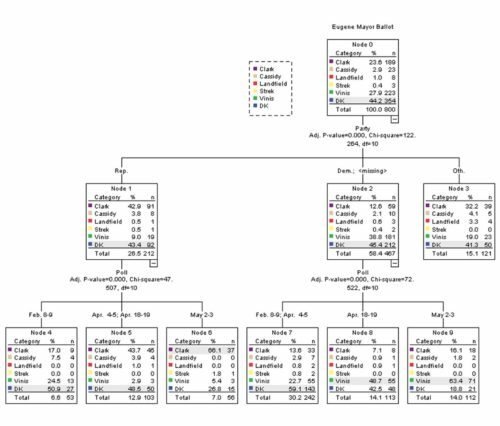 This method adjusts for that lack of knowledge and creates a prediction. In practice, the method is better at predicting the front runner percentage than all the others. First, the last poll, two weeks before the election, had Vinis winning 54% and she got 53%. That implies Vinis had the race sewed up relatively early. Next, as noted in the last post, Vinis gained in early to mid April. From that point on her lead was solid. Finally, Clark’s paid media push at the end appears to have had no significant impact. 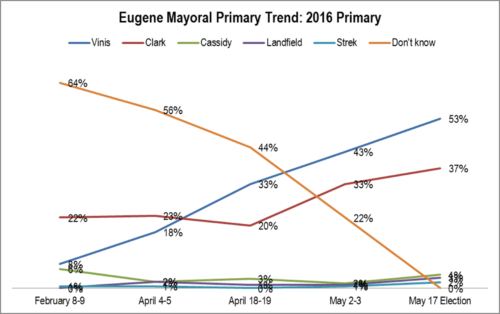 POLLING QUESTION: If the Eugene mayoral election were held today, would you vote for: Mike Clark, Bob Cassidy, Stefan Strek, Lucy Vinis, or Scott Landfield [ROTATE NAMES]? IF DON’T KNOW: Which way would you lean? 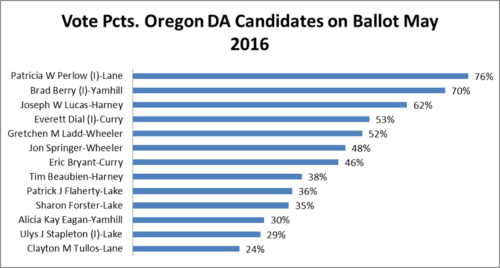 POLLING METHODOLOGY: Data for surveys: 200 live telephone interviews of City of Eugene likely 2016 Primary voters were conducted on each of February 8-9, April 4-5, April 18-19, and May 2-3, 2016. The margin of error for each survey was plus or minus 7%. 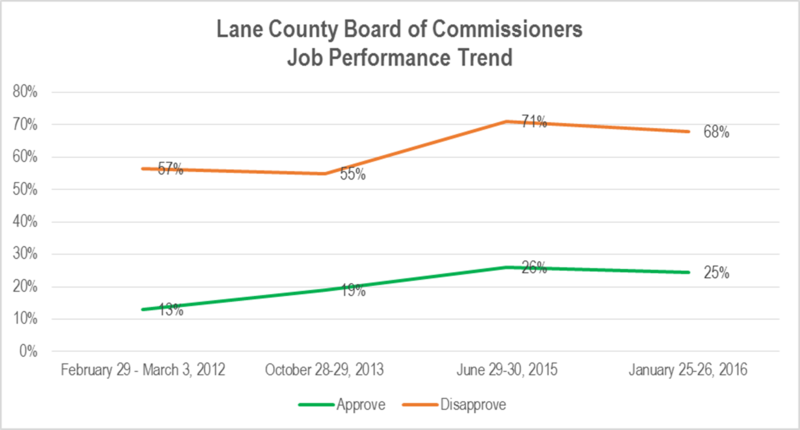 ELECTION DATA: Lane County Elections. Okay, now that we know the magnitude of Clark’s landslide loss, we need to examine how his level of support evolved during the campaign itself. Mike Clark started with a solid lead based on his name ID advantage. As one would expect, Lucy Vinis closed the gap. Vinis broke through in early mid April and maintained a solid lead throughout. Clark’s ad blitz at the end of the campaign was not enough to gain, it might even have caused him to lose ground. Vinis’ break through appears to coincide with the first time both candidates’ messages were presented. 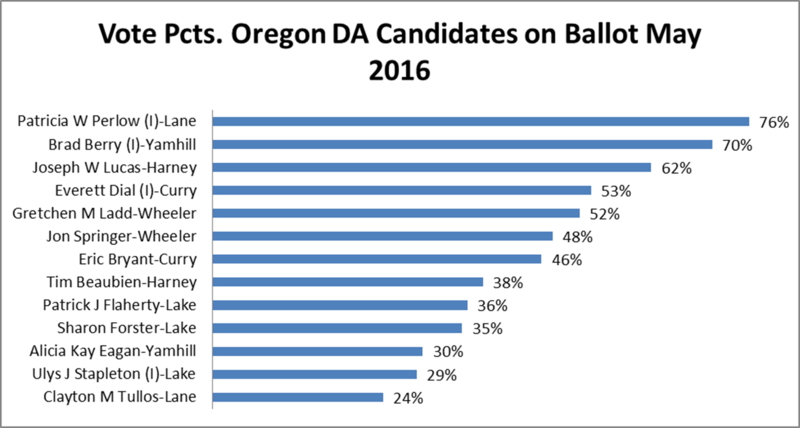 Lane County District Attorney Patty Perlow received the highest percentage among all the DA candidates on Oregon’s May ballot. Disclaimer: Lindholm Company served as the general consultant on the Perlow campaign. 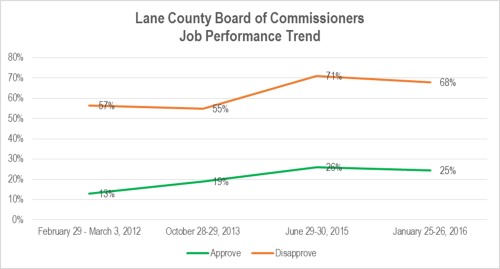 Pat Farr’s landslide win does not mean the Lane County Board is necessarily seen in any better light throughout the county. 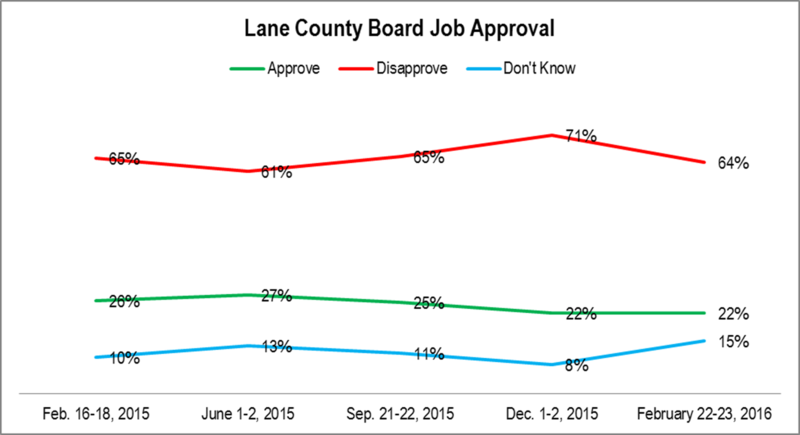 The Lane Board’s job disapproval rating declined, but the approval rating stayed level early this year. 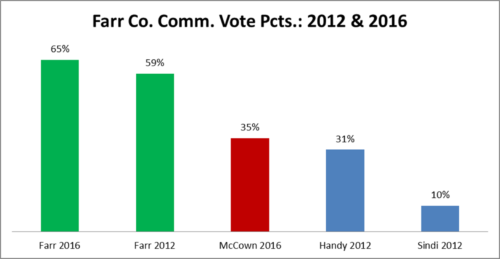 Pat Farr dramatically improved his percentage over 2012 despite facing a strong opponent and a less hospitable partisan registration margin. The district’s registration has been trending Democratic. The net Republican margin has dropped by nearly 5% since 2012. Farr’s opponent in 2012, incumbent Rob Handy, was beset by a wide range of challenges. On the other hand, Farr’s opponent in 2016, Tony McCown, has long experience on the Lane Community College Board and has served on numerous key City of Eugene and Lane County committees. With the exception of Farr himself in 2012, McCown was easily the most experienced challenger to a Lane County Commissioner seeking re-election in the past decade. Disclaimer: Lindholm Company supported and worked on the Pat Farr campaign. 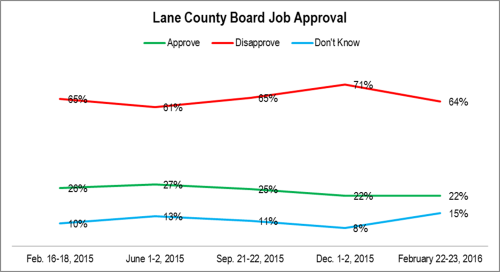 Source: Lane County Elections. 2016 numbers are unofficial as of end of election night. 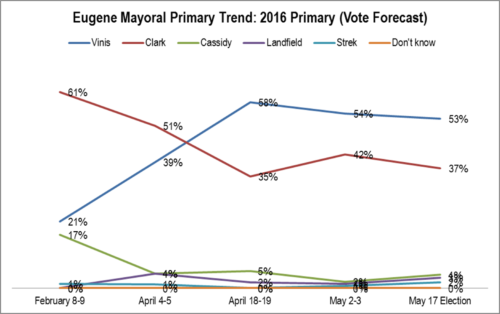 Today’s the day the votes are due and the results start coming in for Eugene’s mayoral race. History can provide a guide and context to the results. One observation is that experience has mattered. 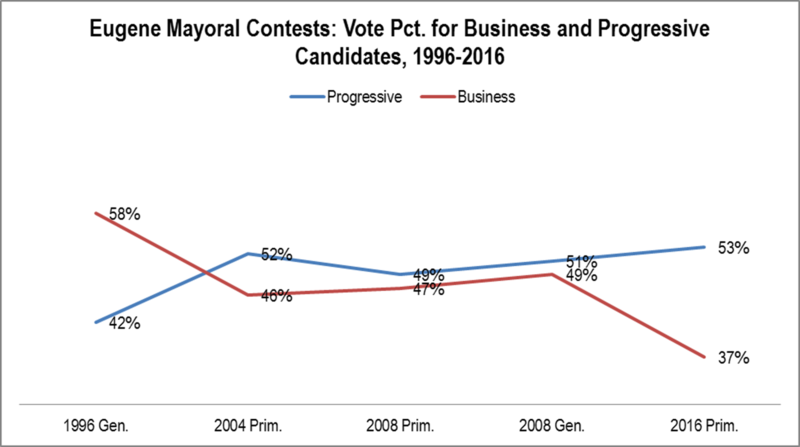 City councilors have an overwhelming advantage when running for mayor. Of the eleven open elections for mayor, city councilors have won eight, or 73%. 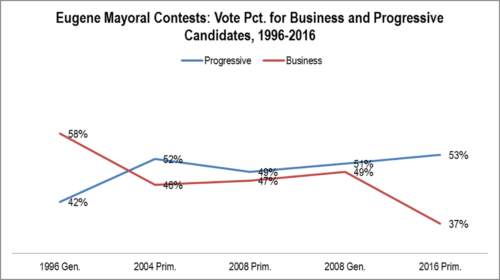 Combining the incumbency and city councilor advantages, fully 15 out of 18 races, or 83%, have been won by a city councilor or mayor since 1944. Along with this, no incumbent mayor has lost a bid for re-election since Eugene had the council-manager form of government was established in May 1944. Piercy’s 2008 run was by far the closest to losing. Another observation is that, during the past quarter century the results have seen a wide spread. The 2000 and 2012 contests, where an incumbent faced no significant opposition were landslides. Among the other four contests where there were at least two major competitors, three (1992, 2004, and 2008) were close and one (1996: Torrey v. Weaver) a landslide. This implies a landslide is possible, though unlikely. Looking at the two major candidates for mayor, Mike Clark and Lucy Vinis, we can see what history implies. Clark is an incumbent city councilor. Vinis, on the other hand, should she win, would be the only mayor with neither significant experience with the city (nothing elected or appointed) nor high-level political experience (Piercy was a former House Minority Leader). This would imply that, based on history, Clark possesses an advantage. On the other hand, the rarity of landslides implies that this will be a close race. Remember that anything can happen. In the Republican Secretary of State race each of the candidates has more definition, though probably more due to Richardson’s run for Governor than Leiken’s terms as county commissioner and mayor. 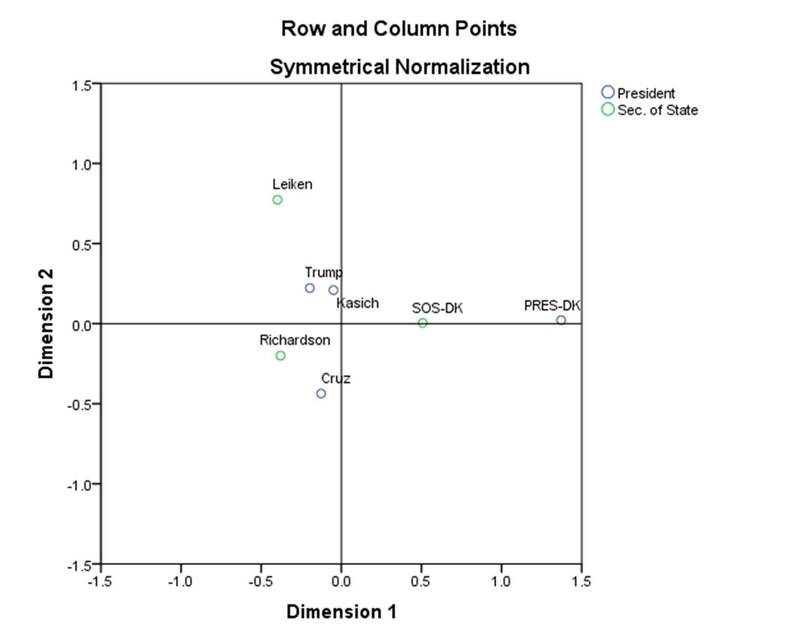 Richardson is closer to Cruz and Leiken is closer to Kasich and Trump. QUESTION: If the Republican Presidential Primary were held today, would you vote for: Ted Cruz, John R. Kasich, or Donald J. Trump? IF DON’T KNOW: Which way do you lean? SAMPLE METHODOLOGY: 400 live telephone interviews of likely 2016 Oregon Republican Primary voters were conducted April 25-27, 2016. Quotas were established for gender, age, and region. The margin of error at the sample median is 5%. STATISTICAL METHODOLOGY: Correspondence Analysis can be seen as a visual version of a crosstabulation. It represents in distance the similarity between responses from two questions. Responses along the same angle tend to be similar. 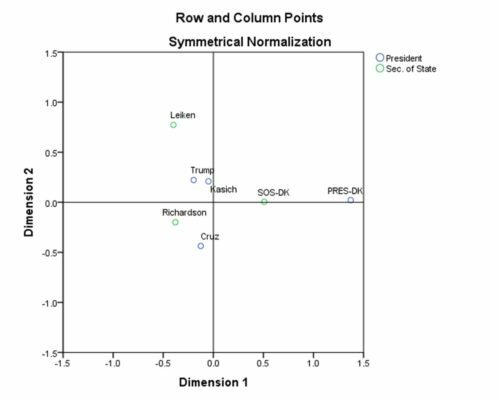 The closer to the center the closer to the center of the electorate.